Is it possible to leave Stephen Colbert speechless? Well, Helen Mirren found a way! Is it possible to leave Stephen Colbert speechless? Well, Helen Mirren found a way! 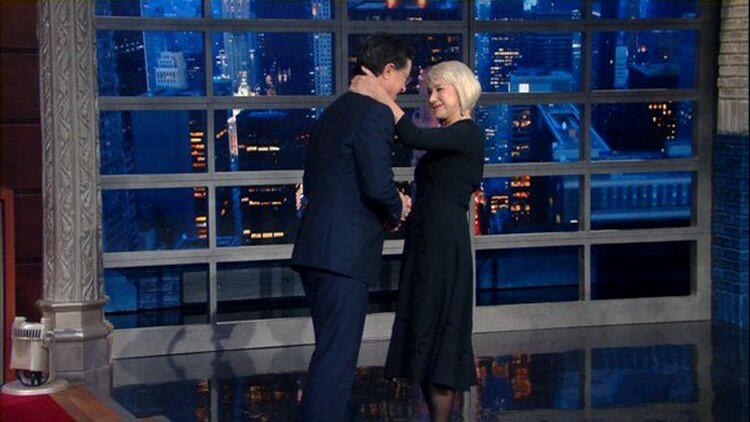 After Colbert introduced her on The Late Show, she walked right up to him, wrapped her arm around him and pulled him in for a kiss. The award-winning actress told Colbert: "I have been dreaming of doing that for about, you know, 15 years. So, I just grabbed my chance. Sorry, I’m so sorry." Colbert replied in turn," I suddenly can’t remember any questions. That is one of the nicest greetings any guest has ever given me."